You may know by now I’m a pretty big Birchbox fan. I just think their customer service is amazing and you know the boxes are pretty great too! I was quite interested when I heard they would be launching their own makeup line called LOC (Love of Color). There will be a series of collections and collaborations with Youtubers and bloggers. (Sigh, maybe one day!) This current collection is partnered with Tati from Glam Life Guru on Youtube, who I somehow have only recently fallen in love with. Seriously how did it take me so long, her channel is amazing! Along with these five eyeshadow sticks there are three matte lipsticks as well. I received one in my Birchbox yesterday and haven’t had a chance to try it yet, but I heard it’s lovely! 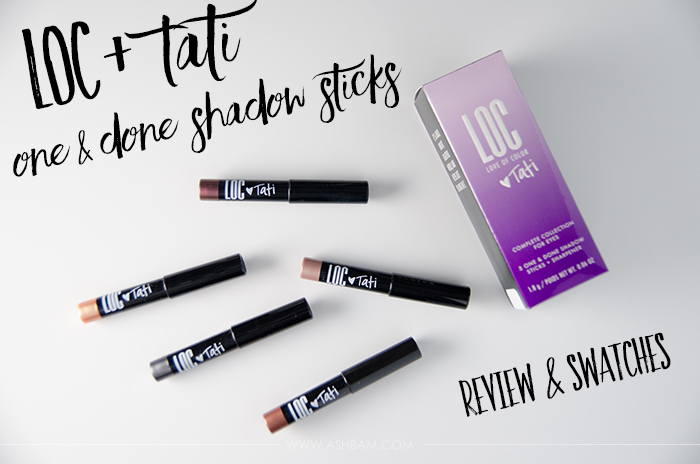 I’ve mentioned a few times that I’m testing out eyeshadow sticks so that was one of the main reasons I wanted to purchase the One & Done Shadow Sticks. The complete set of 5, plus a sharpener was $36 on the Birchbox website, but luckily I had points saved so I only ended up paying $8 and the shipping was free! (Another Birchbox plus, their points program!) I can’t say yet if these are my favorite, but they’re definitely going to be high on the list. They truly last all day and do not budge. Normally with the deeper shades like Smoke Screen or Nite Owl I end up with some transfer thanks to my hooded lids, but nope nothing. I will say that those deeper shades were a bit harder to blend out, but I just added a powder shadow in the crease which helped a lot. They set rather quickly, you only have about 30 seconds to work with them. It says they last up to 11 hours, but I’ve worn mine all day and they still pretty much looked the same when I went to remove them around midnight. Each stick is 0.05 oz and I truly think they’re the perfect size. I rarely get through the full size of anything so these minis are great, especially for travel! I think this is such a versatile collection, from gorgeous neutrals for every day to deep shades perfect for a night out. I was trying to pick out a favorite but I’m not sure if I can. Surprisingly Smoke Screen is near the top, it’s not a color I normally wear, but it looks really great with my hazel eyes. I’m not sure if these collections will be permanent or if they’re gone once they start another one, so I highly suggest if you’re an eyeshadow stick girl like me to get a hold of these soon! They’re simply fantastic! Have you had a chance to try anything from LOC yet? Which shade is your favorite? these look amazing, and the pigmentation looks intense! They definitely are fantastic, I was really surprised at just how pigmented they were! I have the bigger set with the lipsticks and the eyeshadows and love it! 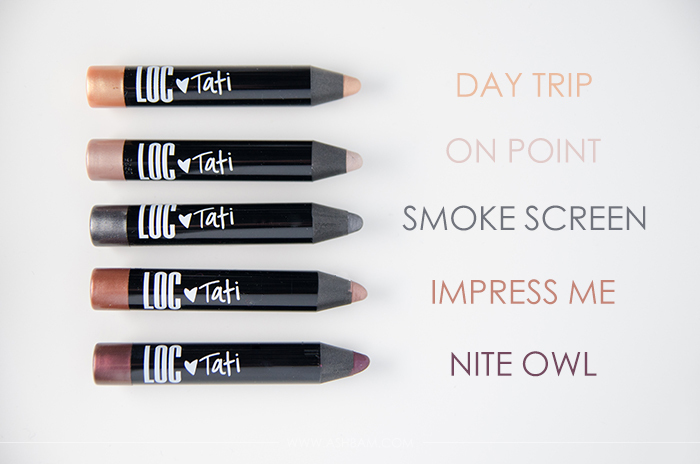 The eyeshadows are an amazing quality and I think Tati did great with the shade selection. I have one lipstick from my box but I still have to try it, it looks like it’s going to be gorgeous! She definitely did, I love them all! It really is! I was so pleasantly surprised!